Home > > Notícias > > It’s Thumbs Up from Zamorano for CCGrass! It’s Thumbs Up from Zamorano for CCGrass! Yet, that is exactly what CCGrass, the world’s largest manufacturer of artificial grass, did when they made the return trip to the Iván Zamorano Club in Chile as 2016 closed out. Happily, the Nanjing, China based firm found a more than happy client waiting for them, to the degree that the football legend himself penned his own recommendation letter. 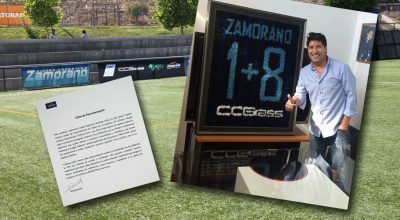 In late 2015, the Iván Zamorano Club chose the CCGrass product “Libra” to resurface their football training field. The newly installed pitch went on to be certified as a FIFA Quality Pro field, as football’s governing body updated their certification system in relation to an ongoing commitment to ensure optimum competition conditions at every level of the game. The club’s Manager of Field Maintenance, Daniel Casas, said that they were very satisfied with the product, installation, service and warranty. In his recommendation letter, Zamorano said, “We want to make the field more natural in looks, feeling and performance. CCGrass gave us an overall suggestion on product selection. They recommended the product ‘Libra’, which is tri-spine with natural appearance and high playing performance. It is a perfect solution for us. “We are highly satisfied with the natural look, comfortable feeling and excellent installation of this pitch. And the players have trained on it with high praise for its best experience. A former member of the Chilean national team who appeared in the 1998 World Cup and four Copa América tournaments, Iván Luis Zamorano Zamora played for several clubs, notably Sevilla and the legendary, player-owned Real Madrid C.F. With the club’s win of the 1994–95 La Liga title, Zamorano was also the season’s top scorer, while in 2004, he was placed among the FIFA 100, a list of the best living football players in the world compiled by Pelé. A powerful and prolific goal-scorer, Zamorano was particularly renowned for his ability in the air, scoring many of his goals from headers. 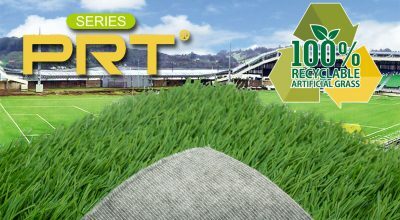 The CCGrass product Libra is an artificial turf surface with a special 3 spine blade structure that has been developed especially for the high level market and is wear resistant to 20,200 Lisport cycles.